When juniors Patrick Westervelt and Simon Olarte studied at the Kasteel Well campus in the Netherlands together last year, they jokingly debated about who could cook better. 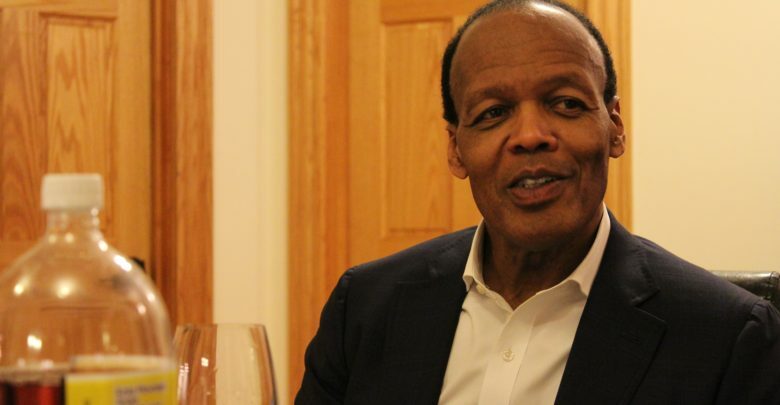 Westervelt said he and Olarte often spoke of a hypothetical cook-off, judged by none other than President M. Lee Pelton. Little did they know that the following spring, they would find themselves eating dinner with the college’s president in their Beacon Hill apartment. A little less than two months ago, Westervelt reached out to Pelton via email detailing the fantasy cook-off. Olarte said he did not realize that Westervelt felt serious about contacting Pelton. “I thought he was totally joking and that even if he does send it, the odds we get a response were probably so low because he’s a busy guy,” Olarte said. Westervelt said Pelton responded within a day and agreed to judge the cook-off. Though the nature of the request seemed rare, Pelton said he attended similar events with students in the past. Westervelt said Pelton’s agreement to judge the cook-off did not shock him. Olarte said he put off practicing his cooking skills until Pelton responded, but then he tried to call off the event. Olarte said he then spent his spring break mastering a few dishes in preparation. In the hours leading up to the cook-off, both Westervelt and Olarte felt unsure if Pelton was even coming for dinner, as they had not heard from the college president since they arranged the date after Pelton’s first response a month and a half prior. It wasn’t until Pelton’s secretary called to confirm the time half an hour before the dinner that they knew he was coming. “I was the only one who fully believed he was going to come,” Westervelt said. 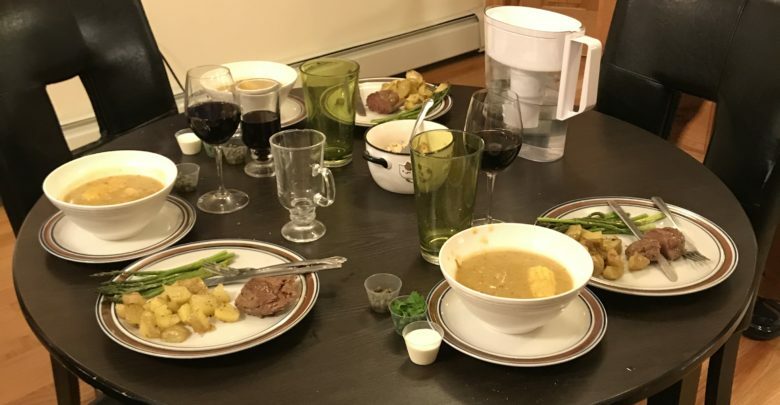 For dinner, Westervelt prepared steak, asparagus, and potatoes—something he said he practiced for a while. Olarte served Pelton a dish that represented his Colombian background—a soup called ajiaco with potatoes, chicken, and corn. When it came to the food quality, Pelton said Olarte’s soup tasted incredible and Westervelt’s steak and asparagus impressed him. While the event started as a competition, Westervelt said Pelton never declared a formal winner. 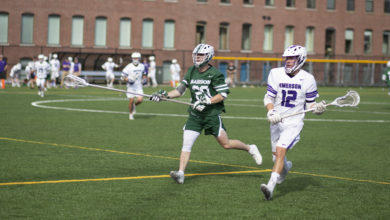 “We went into this with a competition mindset and then as soon as Pelton came in he never mentioned the competition aspect of it and we never brought it up,” Westervelt said. Olarte said it did not feel right to bring up the competition once the meal started. 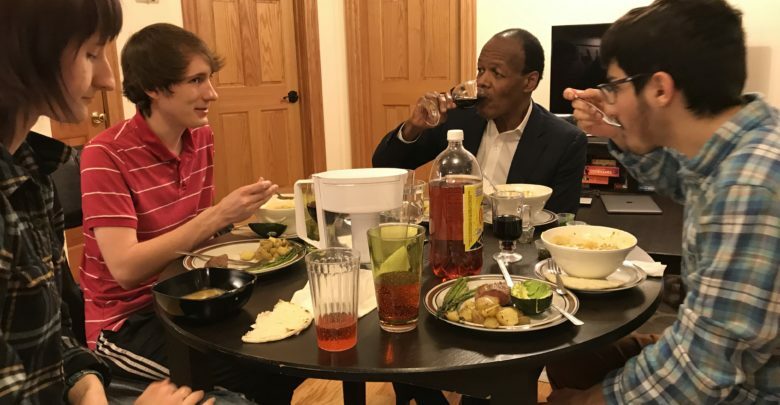 Westervelt and Olarte’s roommates, Kris Theorin and junior Sydney Wild, joined them at the table with Pelton after he insisted they stay for the meal, Westervelt said. 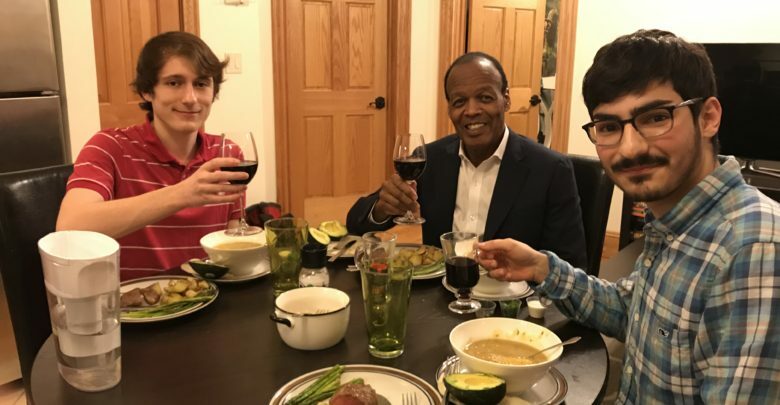 Aside from the dinner, the group drank wine that Pelton brought and talked about a wide range of topics, from what the students liked about Emerson to Beacon Hill. “[Pelton] was very familiar with [Beacon Hill] and he gave us a bunch of interesting facts about people who had lived there,” Westervelt said. Pelton said his favorite part of dinner was the conversation. Both Westervelt and Olarte said the dinner changed the way they saw the college president. Pelton said his main motivation behind accepting the invite was to show students his personality, which he likened to the creation of his own Instagram account in late 2018. He posted a photo on his account with Westervelt and Olarte on the night of the dinner. 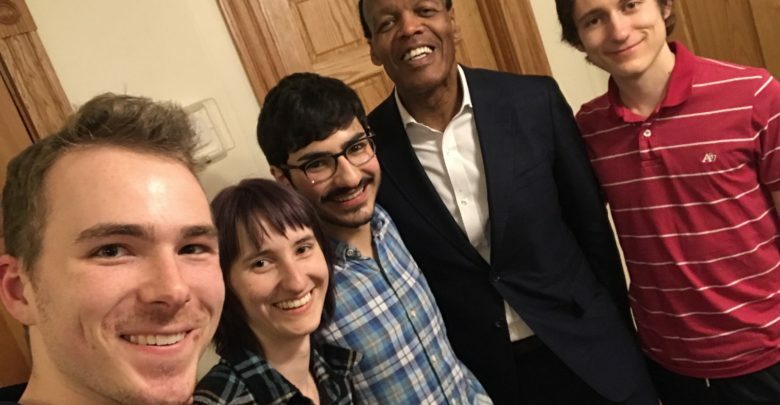 Just beginning an amazing dinner with amazing Emerson students Peter ‘20, Simon,’20, and Sydney, ‘20 and Kris at their swank apartment. Peter and Simon cooked an extraordinary meal. (Sydney and Kris not pictured, but soon to be.) I’m a very lucky president. While he said it would not be feasible to eat dinner with every student due to his busy schedule, Pelton encouraged others to reach out with similar requests. 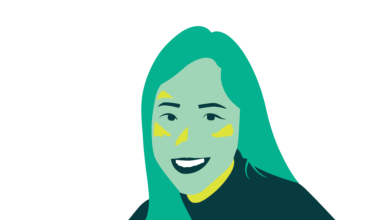 “I welcome the opportunities for students, faculty, and staff to get a glimpse of me on a very personal level and to understand who I am and what I value and how I spend my time,” Pelton said.